I swear, eating while distracted is every bit as hazardous as driving in your sleep. You know those little preservative packets in packages of food? But I’ve always called them Do Not Eat packets. Have you ever wondered what happens if you consume a Do Not Eat packet? It’s not really something I ever gave much thought to, personally. The thing is, I may have accidentally eaten one. You’re probably wondering how that’s even possible. Either you ate it or you didn’t, right? Oh, I’m still scratching my head on this one, too. I was ravenous, so I bought a bag of freeze-dried Fuji apples to devour on my drive home from work. Shoveling handfuls of apples into my mouth, I found myself backed up in traffic about 10 minutes into my drive. Figuring I had time to pass while waiting at a red light, I turned over the bag to read the nutrition facts. It was a single serving bag. Which was great, because the thing was dangerously close to empty already. Freeze dried apples, ascorbic acid, and citric acid. And 220% of vitamin C per serving. More than enough to ward off any threat of scurvy. More importantly, it was made in the USA. Because if I wanted to eat a toxic Chinese import, I’d chow down a box of so-called “non-toxic” crayons. Or one of those questionable McDonald’s Happy Meal toys with 500 microscopic parts. On second thought, those toxic little toys could also lead to asphyxiation. Disturbingly enough, they aren’t not the only things that could present a safety hazard. Further down on the apple bag was a warning. Just some nonsense about a desiccant packet. 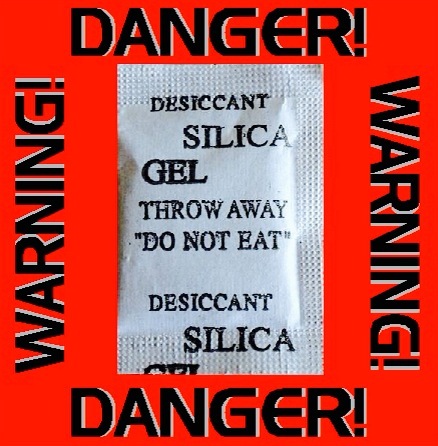 The Do Not Eat packet! Where the hell was the Do Not Eat packet?!? Still sitting in an endless line of traffic, I dared a frantic peek into the bag. There was hardly anything left in it. And no sign of the packet. Maybe they had forgotten to put one in this package? Could I seriously have just eaten the stupid thing? How would I have missed that? Even among generous fistfuls of apples, surely I’d have noticed a difference in texture or flavor. Especially once biting into the packet and unleashing sand-like particles. Were my senses that off? Were my standards that low? And I may very well have reached a new low with this dilemma. You might think I’d have been more concerned for my safety. After all, I could have ingested a potentially hazardous substance, for all I knew. Yet, I found the whole thing mildly amusing. Did this kind of stuff actually happen to other people? Or was it truly just me? By this point, I’m pretty well convinced it’s just me. When I arrived home 20 minutes later, I Googled “accidental ingestion of desiccant packet”. Which immediately directed me to the poison control website. The information was surprisingly reassuring. Apparently, one can safely scarf down the equivalent of an entire shoebox-worth of those packets and likely only experience stomach discomfort. But who would unknowingly devour a whole box of that crap? One with lower standards than me, perhaps? Continuing on with my online self-diagnostics, I grabbed a couple of mini blueberry muffins. Still needing a little more reassurance, I decided to test out a theory. Leaving the wrapper intact, I made a simulated attempt at eating a muffin. Would I notice when I bit into a chunk of the thin paper? I was genuinely intrigued now. I immediately noticed the texture difference between the yummy moist muffin and the grainy paper. But then, I also wasn’t distracted the same way I had been while driving. A tray of sugar packets caught my eye a few days later at a restaurant. I swiped one and shoved it in my purse. To test something out a little later, just for kicks. Let’s just say I didn’t get too far with that one. The paper had the consistency of notebook paper, and the sugar felt like grains of sand. But there was no mistaking a foreign substance’s assault on my palate. Even so, a Do Not Eat packet was still smaller and not as grainy as a packet of sugar. Whether I did or did not eat a desiccant packet still remains a mystery. But the fact of the matter is, I’m more or less okay after maybe or maybe not having eaten one. Do not eat? A little late for that, don’t you think?